I had to rub my eyes in disbelief when I spotted this miniature of the Macallan 12yo ‘Fine Oak’ on the Loch Fyne’s website. With the 12yo now discontinues, finding bottles of any size is becoming rare, or expensive, or both. Although the 10yo ‘Sherry Oak’ is generally considered marginally better than the ‘Fine Oak’ of the same age, it’s the opposite way around with the 12yo. Jim Murray, author of The Whisky Bible, gives the 12yo ‘Sherry Oak’ 93/100 but the 12yo ‘Fine Oak’ 95.5/100. Jim Murray describes the nose of this Macallan as ‘faultless’ so it’s a bit strange that he only gives it 24/25 rather than 100%. He goes on to say of the taste “a near perfect entry” and “juicy yet enough vanilla to ensure structure and layering.” He then summarises with “a whisky whose quality has hit the stratosphere since I last tasted it.” So I’m glad I found a sample of it, albeit only 5cl. Not that it’s gone forever because I’m sure bottles of the stuff will be appearing in auctions for the rest of my lifetime. Some never being drunk, just passed from collector to collector. 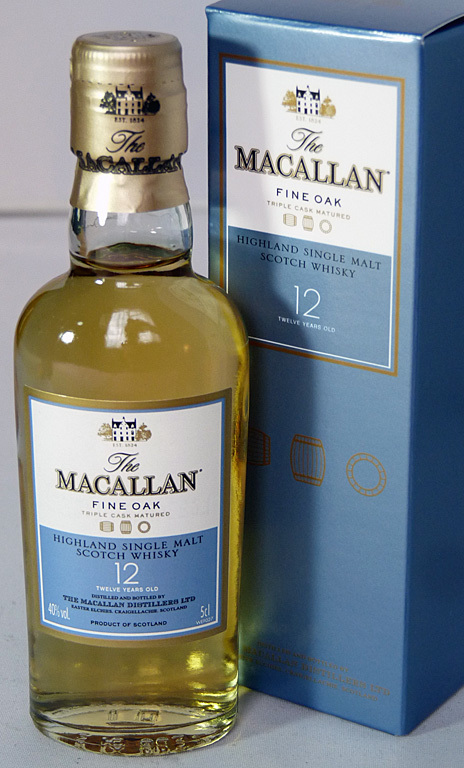 This entry was posted in Macallan and tagged 12yo, 40%, 5cl, Fine Oak, Loch Fyne, Macallan, Single Malt, Speyside. Bookmark the permalink.